It is no doubt that no matter children or adults like Disney animations. Almost every DVD movie fans will have a great collection of Disney DVDs. Then how to keep the Disney DVD movie disc away from scratch or damage? Copy and rip Disney DVD to your Mac computer is certainly a good way. 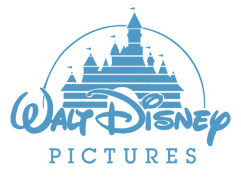 But you will find it is not a easy task since latest Disney DVD movies are all protected with new copy protection. 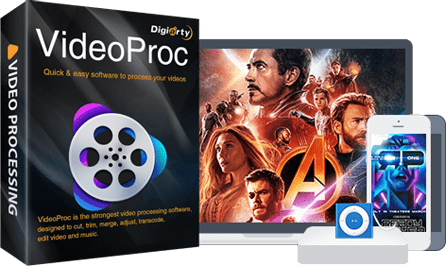 The strongest video processing software to meet all your needs. • Enjoy lifetime FREE upgrades to future version. 30-day money back guarantee. • Record, convert, compress and resize 4K UHD, HD, SD videos with high quality. • Download videos and music from 1000 sites, including YouTube, Viemo etc. • Cut, crop, merge, split, rotate / stabilize video, apply effects, add subtitle etc. Not all DVD fans know what Disney DVD copy protection is and how to judge which DVD is protected from decrypting. Generally, there are several ways to see if your DVD movies are protected by new copy protection. When you use typical DVD backup tool to backup Disney DVD movies, you will get error when copying or DVD files with big size, even larger than 50G. It is not playable on DVD player which is not matching for the protected DVDs. The new copy protection will prevent the DVDs from ripping by general DVD ripping software and the videos converted from DVD will be out of order. It may even shorten the life for DVD drive if wrong decoding scheme is misused. Many Mac users may tried to rip Disney DVDs by handbrake before, but lots of them got errors when starting the ripping or during the ripping process. 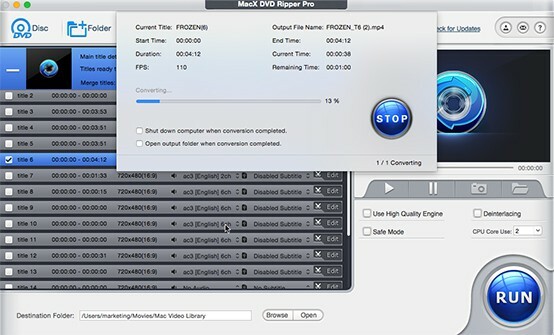 However, MacX DVD Ripper Pro is one of the few solutions which successfully solve this problem and backup new copy protected DVDs released by Disney, Paramount, Lionsgate, Warner and many other companies, Spectre, The Hunger Games, Inside Out, Zootopia, Finding Dory, Transformers, Kungfu Panda 3, The Martian, etc. Although almost all other DVD backup programs got stuck when working on these protected DVDs, MacX DVD Ripper Pro is able to rip all them to Mac or convert them to other video formats compatible with portable devices easily and quickly. Besides ripping the new Disney copy protections, it also supports other copy protections that are commonly used in DVD movies, like Sony ArccOS, CSS encryption, region protection, UOPs, APS, etc. Here we will show you how to get started with MacX DVD Ripper Pro! You will see, with with this top-rated DVD decrypter yet ripper, you can decrypt and make backup of your favorite Disney DVD movies to Mac computer , iPhone XS/XS Max, iPod, iPad Pro/Mini 4, Android, Samsung, Huawei, etc. with only a few clicks. Before ripping Disney DVD movies, please make sure you have full copyrights of your DVD and backup the encrypted DVD for fair use. Don't use it to break the DVD copyright law. 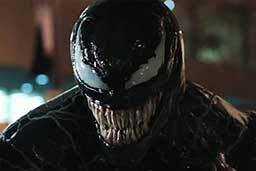 Venom - Journalist Eddie Brock's body unintentionally merges with the alien Venom, when investigating one of Carlton Drake's experiments. And Eddie is endowed with superhuman power by the alien but has to release the alter-ego Venon to save his life. Free download MacX DVD Ripper Pro, fire it up and insert the Disney DVD disc. You can load from DVD driver by clicking "DVD Disc" or from DVD folder, DVD ISO image file. After completing movie content loading, this Disney DVD ripper software will analyze your disc and display all the available segments. The Mac DVD to digital video converter will also automatically choose the recommended title to rip. The title in this tutorial is just an example. Tips: If this Mac DVD ripping software can't select the title correctly, or the segment recommended by this app could not be converted smoothly, please go to the optional step listed below. For Advanced users, this Mac DVD ripper for Disney decryption gives you the choice to adjust the decoder/encoder parameters to suit a particular use. The output settings can be tailored in terms of video codec, video bitrate, frame rate, aspect ratio, resolution etc. You can also edit the video by trimming segments, cropping video size, merging files, adding subtitles etc. Step Four: Start Disney DVD Ripping. After finish the above steps, click the "RUN" button to start Disney DVD decryption and DVD conversion, you could view the conversion progress and are able to cancel the converting process at anytime. 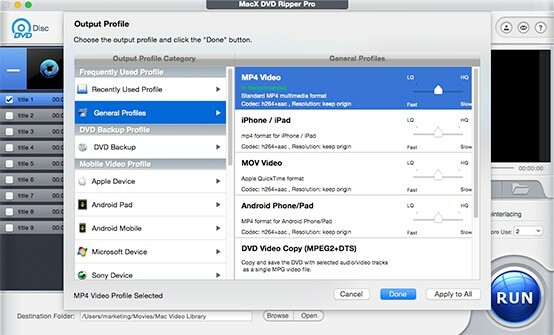 MacX DVD Ripper Pro is an all-round DVD decryption program to bypass the copyright protection of X-project DRM which is widely applied by Disney, Paramount and Warner. Apart from supporting Disney copy-protected DVDs, this Mac DVD Ripper also has the capacity to strip the encryption from Sony ARccOS, region code, CSS and RCE, UOPs, perfectly handling the newly released DVD movies such as Disney Zootopia, Avengers: Infinity War, Venom, Incredible2 2, Hotel Transylvania 3: Summer Vacation, Deadpool 2, Avengers 2: Age of Ultron, Jurassic World: Fallen Kingdom, The Meg, The Predator and more.